Analysis: There was little chance Rosas would sign anywhere else given his prior status as an exclusive-rights free agent. 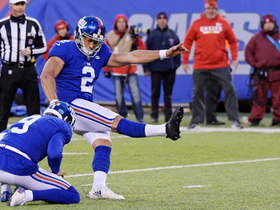 Regardless, the breakout fantasy kicker and 2018 Pro Bowler is now officially under contract with the Giants through 2019 after nailing 32 of 33 field-goal attempts last season, which set a franchise record for conversion percentage (97.0). 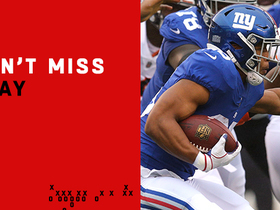 It's possible he could even build upon this production if the Giants' Saquon Barkley-led offense can take a step forward in 2019. 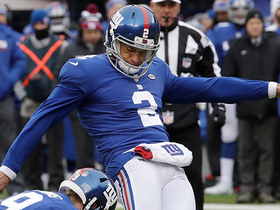 Analysis: The Giants' decision is unsurprising after Rosas turned in a Pro Bowl season in 2018 that included a stellar 32-for-33 success rate on field-goal attempts. The 24-year-old enters 2019 as a reliable kicking option with a firm hold on the job. Analysis: Rosas was nearly perfect on the year, making 32 of 33 field-goal attempts -- including all four from 50-plus yards -- to earn his first Pro Bowl nod. Kickers can be volatile from year to year, but the Giants might have found their long-term answer at the position. 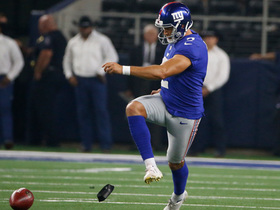 Analysis: The Giants were shut out Sunday, marking the first game this season that Rosas did not attempt a field goal. He remains 28-for-29 on field-goal attempts this season, cementing him as one of the most accurate kickers this year. Analysis: Rosas converted from 35 and 23 yards on his respective field goals, bringing his record to an incredible 28 of 29 on the season. 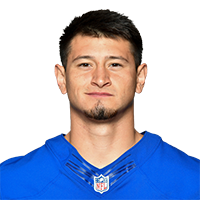 Although he'll be disappointed by missing his first extra point of the campaign, Rosas has still scored in double figures in three straight games, and his 109 points are tied for sixth among kickers league-wide. 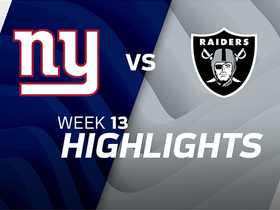 Analysis: Among Rosas' three successful field goals was a 57-yarder which set the Giants' franchise record, and a 44-yard attempt in overtime that sealed New York's victory. The second-year pro continues to build upon what has been a fantastic sophomore season, having missed just one of his 27 field-goal tries and remaining a perfect 21-for-21 on extra-point attempts. 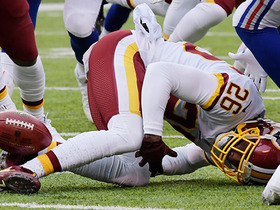 He'll work to log another strong outing against the Redskins in Week 14. Rosas converted all three of his field-goal attempts and his only extra-point try during Sunday's 25-22 loss to the Eagles. Analysis: Rosas recorded his fifth perfect outing in a row, and he continues to build upon an outstanding season. He's missed just one of his 24 field-goal attempts in 2018, and he remains a perfect 18-for-18 on extra-point tries. The second-year pro faces a tough matchup against the Bears' defense Week 13. Rosas made his only field goal as well as all five of his extra-point tries in Sunday's 38-35 win over the Buccaneers. Analysis: Rosas converted from 52 yards on his lone field-goal attempt. Thanks to that effort, he's still missed just one of 21 field-goal opportunities this season, and remains a perfect 17-for-17 on extra points. That's allowed the second-year pro to post a respectable 77 points through 10 contests. Rosas made both of his field goal attempts and three PATs on Monday against the 49ers. Analysis: He's unlikely to be a top kicker on such a mediocre team, but Rosas has been reliable and accurate this year and could keep the job for a long time. Washington Redskins defensive back Bashaud Breeland bobbles the kick return and it nearly results in a turnover. New York Giants kicker Aldrick Rosas has his extra point blocked following a big play from running back Orleans Darkwa. 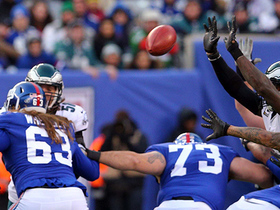 Philadelphia Eagles safety Malcolm Jenkins comes up big and blocks the New York Giants go-ahead field goal. 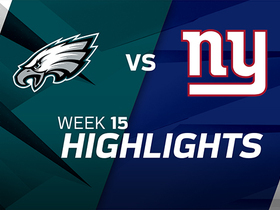 Watch the best plays from the Week 15 match up between the Philadelphia Eagles and the New York Giants. 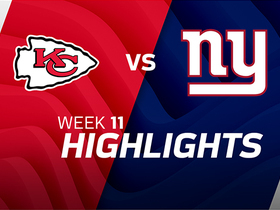 Watch the best plays from the Week 11 match up between the Kansas City Chiefs and the New York Giants.